Day 2 of 4 of my U.P. Adventure. Find day one here. I don't know why, but for some reason, whenever I'm on vacation, I get up super early. It's like I want to soak everything in and see everything and so my body is just ready to go bright and early. I woke up at 6am Michigan time but 5am Wisconsin time. 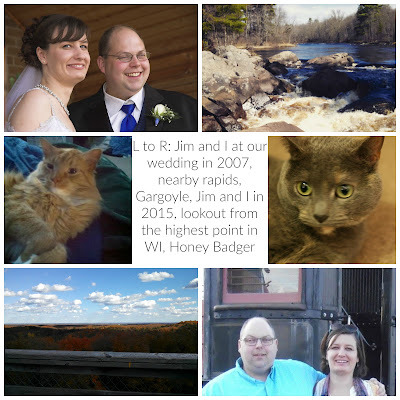 (The Central Time Zone ends and Eastern Time Begins in the Porcupine Mountains.) So, I called my mom. My parents are up super early all the time. I usually am not because I work mostly second shift. So, talked to mom for a while, made some breakfast, read a little, and then I showered and got ready for the day. Everyone else was still sleeping so I drove into Calumet, which is practically the same town as Laurium. Like you're in Calumet, you turn right and go two blocks and there's a welcome to Laurium sign. Kind of cool. So, anyway, I checked out downtown Calumet, found out when their used bookstore opened and then debated if I needed more coffee or not. I decided not since I'd already drank half a pot. I got back to the house and the girls were all pretty much ready to go which was awesome. This was the day with the most on the agenda, so we loaded up the car and headed north. For those of you unfamiliar with the Keewenaw Peninsula, it's a little finger that juts of the top of the upper peninsula. The northern part of the Keewenaw is actually an island thanks to the Keewenaw Waterway. The day had started out a little on the cool side, but we figured it'd warm up and it went on. It did the exact opposite. It got colder and colder. By the time we got to Eagle River it was 45 degrees. After taking pics of the waterfall there, I changed out of crops and into jeans and a sweatshirt. We trudged on. 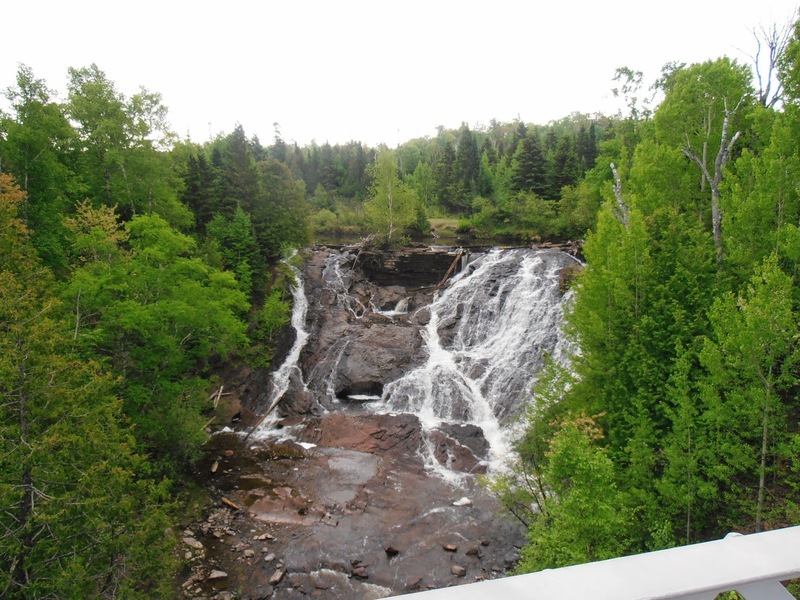 Just outside of Eagle Harbor is Jacob's Falls, which of course we had to get pictures of. It's a nice little fall right along the road. 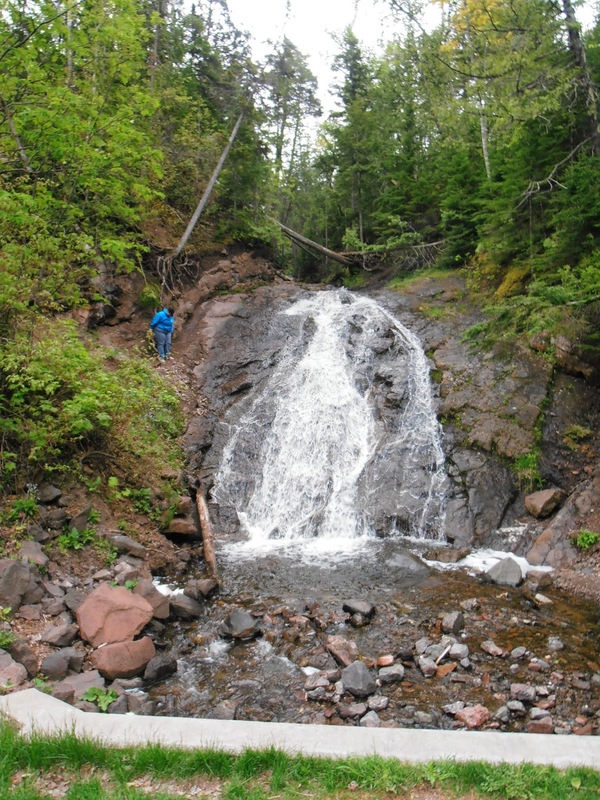 You just pull over and there it is, smallish but, quietly washing over the rock on the right side of the road, running through a culvert under the road, and then into Lake Superior which is just on your left. Right after Jacob's Falls is Jampot, a little shop ran my some Catholic Monks making jams, breads, candy and cookies. They have lots of unique flavors like pear butter, thimbleberry, strawberry rhubarb, as well as traditional flavors like raspberry, blueberry, apple butter and the like. I had to get pear butter (one of my favorite flavors and it can be hard to find) and some cranberry ginger for my parents. After that we were on to Eagle Harbor which has a lighthouse museum. I've visited it before and was looking forward to taking my friends to visit, but unfortunately it didn't open for the season until the next day. Just our luck. We did have fun looking around the grounds though, even if we couldn't go inside. It was super foggy on the lake. Like so foggy you could only see a few feet out, but while we were there it started lifting and pushing back a little. Unfortunately, it didn't warm up much. So, we did a little shopping in town before heading on to Copper Harbor. 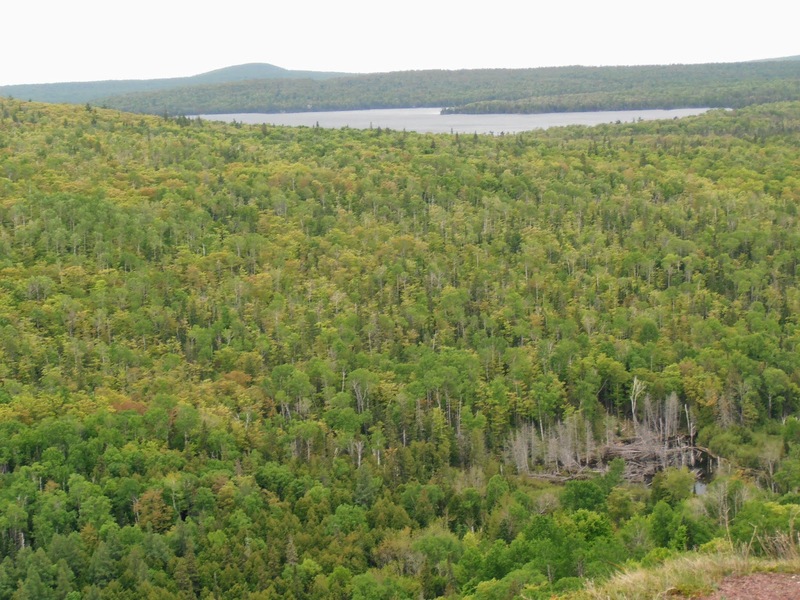 Right before Copper Harbor is Brockway Mountain Drive. It's about 9 miles of curvy road but the view at the top is absolutely amazing. It's 1,320 feet above sea level and once you reach the top, you can see for miles. The road was a little rough in places and the little shop that used to be at the top of the mountain is gone. (Later on, we found out from one of the locals that the mountain used to be privately owned, but was sold to the Eagle Harbor Township in 2013 and the shop was closed.) The view is breathtaking, but I'm not daring to climb out to the edge to get really great pictures. Copper Harbor is the cutest little town, complete with fudge shops and rock shops. We ate lunch at The Mariner North which is a nice little hotel/ restaurant combo that had pretty good food with a lot of their dressing and things being made in house. Our waitress was very friendly, and they had great coffee! I don't know what kind it was but it was great. We did a little more shopping after lunch, and then it was off to Munising. Munising is three and a half hours from Copper Harbor and we had to be there at 7:15 pm to catch our boat for the Pictured Rock National Lakeshore tour. So we piled in the car and headed out. It was a little drizzly and just that kind of day that makes you want to nap. So the girls did that and I drove. We had to make a stop for gas and one for a bathroom break and we ended up getting to our motel about a half hour before the tour. We checked in and then jumped back in the car to get to the dock and head out again. The boat tour is a little over two hours. They show you the lighthouse on Grand Island, Miner's Castle, and some of the other rock formations along the shore, as well as explain how different mineral deposits washing over the rock make different colors. It's pretty cool and the tour guide did a great job cracking jokes and keeping it interesting, but it was so cold out there and rainy. You're in a covered boat but about half way through I was just ready to go to the motel, put on my pjs and go to bed. By the time the tour was done and we were heading back, the fog was back, and for the last hour you couldn't see much besides the fog. I think the tour would be much more fun on a nice summer day, when it's bright out and you could sit on the top deck and gawk and take pictures. We finally got back to our motel around 11pm. We stayed at the Terrace Motel, which is cheap, pretty clean, has cable and wifi, and a kitchen onsite if you want to do a little cooking. We were all freezing when we got back, but there was no hot water to take a shower in. My guess is some of the other guests were also on the boat tour, beat us back to the motel and used up all the hot water. :) Seriously, because by the next morning we had plenty of hot water. The beds were not super comfy, but we were all tired and fell asleep pretty quick. I still have to get to the UP! You really should, Ashley! It's so beautiful up there. It's all flat and fields here and it's so lush and green up there. It's such a contrast for only being a few hours away. And PS- everyone is super friendly up there.